When building a new home or an addition, you want an efficient home that will reduce heating and cooling bills and minimize environmental impact. Properly insulating and air sealing your home is one of the most cost effective steps you can take to immediately address these considerations. 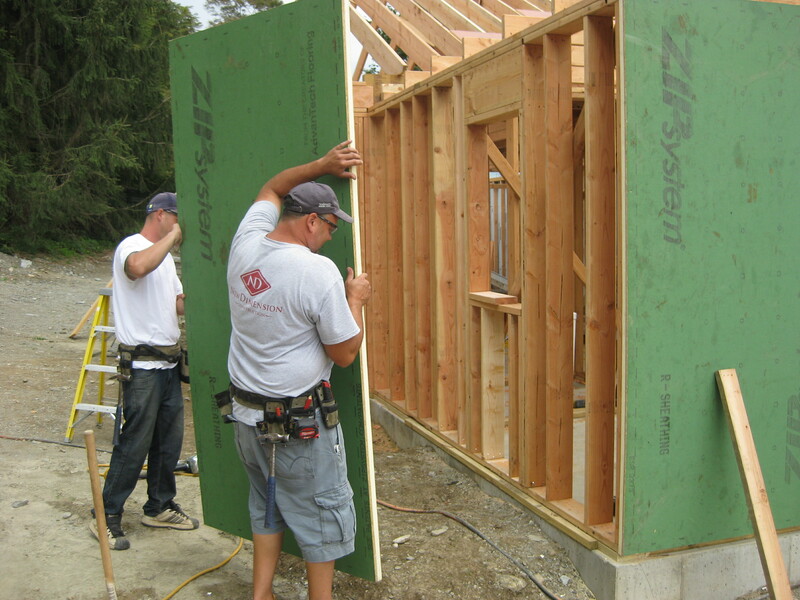 A newer product on the market helps to achieve a properly insulated home: ZIP System® R-Sheathing insulated panels. What is ZIP System® R-Sheathing? ZIP System® R-Sheathing is a five-in-one insulated panel designed to provide bulk water, thermal, air, and moisture resistance. 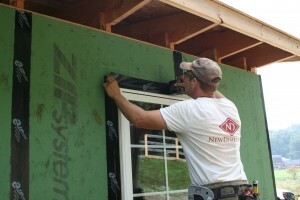 When installed with ZIP System(TM) tape, a seamless airtight seal is created. This is part of what is called the “thermal envelope.” A more effective thermal envelope will provide greater energy efficiency and reduced heating and cooling costs. If you follow us on Facebook, maybe you’ve see our latest project – building a new caretaker residence. This project has given us an opportunity to use this latest building technology. 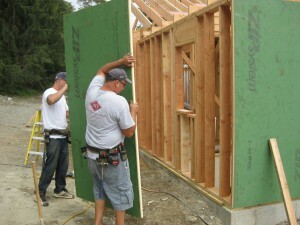 Who should be interested in ZIP System® R-Sheathing? Homeowners building a new home or an addition should consider what it will be like to live in the home once the project is completed. Air leaking through walls and other openings can create problems besides drafty rooms. Musty odors, dust, even peeling paint can all possibly be caused by inadequate insulation or sealing of your house’s envelope. So besides reducing your heating and cooling costs, another benefit to consider is your increased comfort and well being. Contractors should be interested in the product, primarily because building codes stipulate certain R-values be met on all new construction. The Zip System R-Sheathing provides an R-value of 3.6 for the 1-inch panel and 6.6 for the 1.5-inch panel. Plus, the method of installation takes less time than traditional methods for installing rigid foam on exteriors, allowing you to keep your project moving on time. Anyone interested in reading a detailed discussion of installation can check out our article entitled “First Time Using Zip R-Sheathing” featured in the October 2013 issue of JLC – The Journal of Light Construction. You can also download the article by clicking here. Overall, we liked working with the product and will encourage our clients to consider this option. If you are curious about costs or where to get the product, you can contact us for more details. We’d love to hear from you.